Desert Community Bank provides unmatched levels of customer service in a hometown atmosphere. For more than 35 years, that’s the standard we set for our neighbors in the High Desert communities of San Bernardino County in Southern California. And it’s a standard we strive to maintain every day. Supporting programs that benefit the local economy and enrich lives. Our employees—your neighbors—generously volunteer time and resources to individuals and communities with low-to-moderate income in areas such as economic development, housing, and career development. Investing in branch upgrades, ATMs, and our website to better deliver the products and services that lead to personal and professional success for our customers. Since 1980, we have been honored to contribute to the place we call home. Please do not hesitate to contact us or visit a branch with any questions you have or support you need. 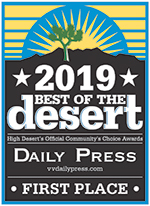 Desert Community Bank is part of the award-winning Flagstar Bank. This means our personal and business customers can access an even broader foundation of skill and experience for all of their financial needs. Already a strong mortgage business presence in California, Flagstar was drawn to Desert Community Bank by its loyal customer base and dedication to the community. Flagstar proudly exhibits those same characteristics in its home state of Michigan. In Desert Community Bank, it recognized a kindred spirit with whom an even brighter future will flourish. Chartered in 1987 as a federal savings bank, today Flagstar has assets of $16.9 billion, is the fifth largest bank mortgage originator nationally,1 and the third largest savings bank in the country.2 Our team’s financial craftsmen possess skill and pride in their work that is reflected in their commitment to creating solutions tailor-fit for each customer.